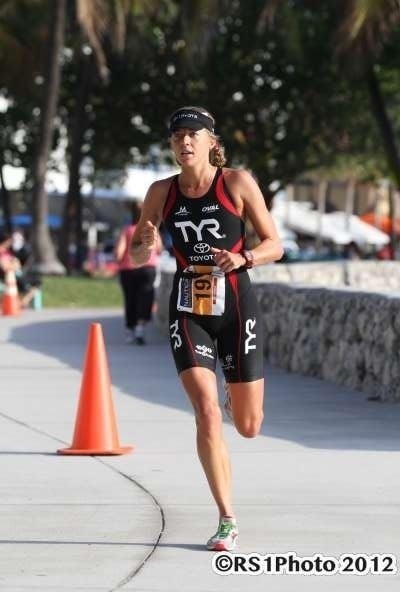 My first Olympic distance race of the year kicked off in South Beach, Miami this past Sunday. This was my second time back to the race and I was successfully able to defend my title! This race was the first race in the Lifetime Fitness Race to the Toyota Cup Series. 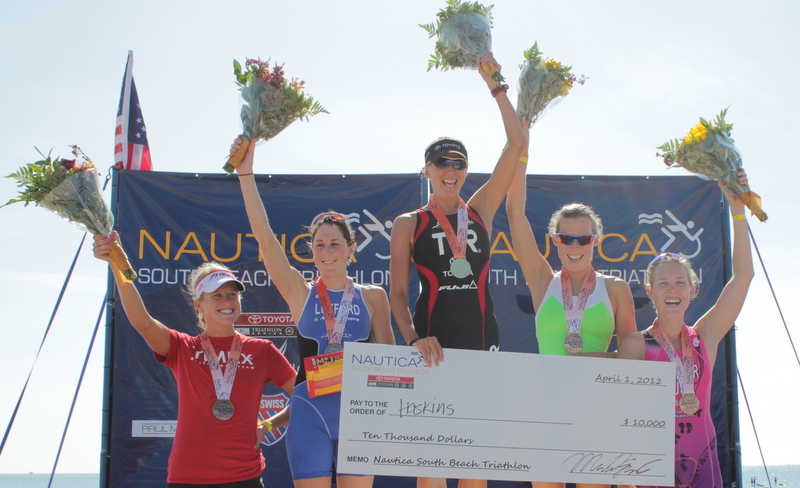 Next race up in the series is the CapTex Tri in Austin at the end of May. Going into the race, I was feeling confident in my training; however, it is always a little more nerve racking heading into the first Olympic distance race of the year. You never know how your body is going to respond to the test of racing! I am very pleased with my progress in my fitness thus far and look forward to the next build up before St. Anthony’s at the end of the month and most importantly the San Diego WS race. Race morning I went to check out the weather temperature outside at 5am and it was quite a scene! People were staggering out on the streets, still enjoying their Saturday night and singing/shouting/dancing. Getting to transition on the streets is usually a challenge trying to avoid the cars, but this time was different in attempt to avoid crashing into the intoxicated late night party goers. The race began very early, just as the sun began showing it’s first rays of light. Men and women started together, which is very different from most races, when women usually start two to three minutes behind the men. I decided to keep my distance from the men, since they are much more explosive and powerful on the run into the water. The buoy was only 100 meters from shore, so I knew the first turn had the potential to be violent. I kept my speed down at the start and gradually worked my way around the pack of men. After 500meters into the swim, I found a small group of two athletes to work with. 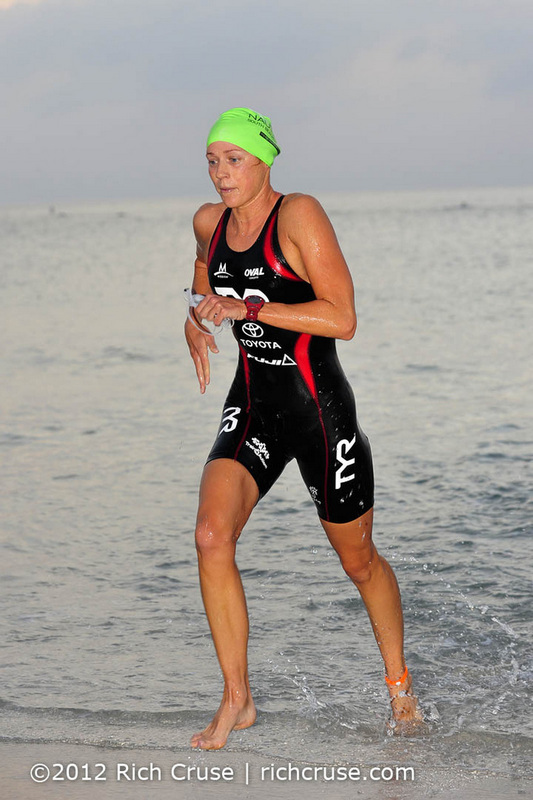 Exiting the swim, I had a one minute lead over the next pack of women. Thanks to Rich Cruse for this awesome photo! 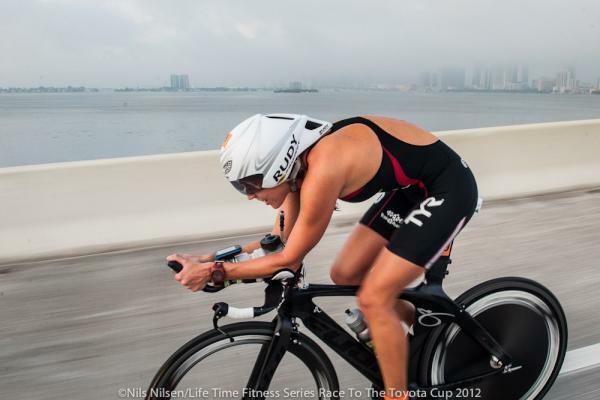 After the 500 meter transition run, I headed out on the bike course on my new Fuji D6! Nate just finished the bike last weekend and it is fully equipped with Di2, New Zipp 404 Firecrest front and Super 9 Disc, ISM TT saddle, Sampson Carbon Pedals, Oval 950 aerobars, and Quarq Cinqo Power Meter I love my new ride, and I can especially tell a huge difference in the improvement in climbing and responsiveness in my cornering. For me, the bike portion was the most painful, but I kept my focus on the road, staying smooth and keeping constant power on the cranks. I exited off the bike with a 30 second lead over the rest of the feild and headed off onto the run. Click here for my Quarq Cinqo Power File on Training Peaks. Thanks to Nils Nilsen for this great shot! The run course was twisty and windy at the start, especially when the course was open to the public making it more twisty in effort to avoid the pedestrians. Four miles of the run is on a wooden bridge along the beach boardwalk. With the rainstorm the day before, it left the wood wet….and a little slippery. Fortunately, my shoes had descent traction, but I remained more on the cautious side while running on the bridge. I was surprised how strong I felt during the run. I kept a solid tempo throughout and was excited to get to the finish line. Thanks to RS1 Photo for his great shot as well! It feels great to get the first win of the season accomplished! I am looking forward to the rest of 2012 and continue to put forth steady work in my training. It also feels awesome to be DRIVING home in my Toyota Camry verses getting on an airplane. Cutting back on travel this spring has really helped immensely in my training and recovery. I can’t thank my sponsors enough for all of their support in my racing and training.